The port for the WU-1a/WU-1b is underneath a door that protects the ports when not in use. Open the door to place the wireless adapter for use. The WU-1a and WU-1b wireless adapters quickly install on the camera. When not in use, the wireless adapters can be removed and stored in a camera bag. To turn it on, hold the button on the WU-1a/WU-1b until the green light glows. With the WU-1a or WU-1b wireless mobile adapter installed and the camera turned on, you can shoot as you normally would. You can also remotely shoot, using the wireless mobile utility app on your smart device to frame a photograph and fire the shutter. Wi-Fi is available for Nikon’s pro digital cameras (D4 series, D3 series, D800 series, D700 series and D300 series) as photojournalists and other pros need a way to get their images from the camera to their picture editor or wire service so they can be posted online shortly after being captured. Nowadays, high quality Nikon DSLR images at world events such as presidential inaugurations and other newsworthy happenings, the Olympics and other big sporting events are posted online by news organizations mere minutes after photographers are taking photographs. Although your smartphone likely has the capability to shoot stills or video, the quality is nowhere near the high quality of a Nikon digital SLR. DSLR cameras utilize a much larger image sensor than do smartphones and tablets. The DSLR sensor is designed to give you a higher resolution, wider dynamic range, the ability to shoot in low light and use high ISOs—all which generate high quality image files. Your Nikon DSLR is also compatible with over 85 current high quality NIKKOR lenses, from fisheye and ultra-wide-angle to super-telephoto zoom ranges, Micro-NIKKOR and perspective control lenses as well as teleconverters which extend the focal length range even more. In addition to lenses, your DSLR is also compatible with a range of Nikon Speedlights—accessory flashes that will allow you to better illuminate your subjects, both on or off the camera. These flash units are also compatible with a range of accessories such as color correction filters and light modifiers, which will allow you to get as creative as you want in lighting your subjects. Select Nikon DSLRs, Nikon 1, and COOLPIX digital cameras use the optional WU-1a wireless mobile adapter; while other models of DSLR, and Nikon 1 cameras utilize the optional WU-1b wireless mobile adapter allowing you to take photos with these high quality Nikon digital cameras, NIKKOR lenses and Speedlights, and upload them via an Android™-powered smartphone or tablet or iPhone®, iPad® and iPod touch® to your computer, to the web or into an email. The app. also lets you access the photos on the media card in the respective cameras using your smart device. Check your camera’s manual to see if your Nikon camera utilizes either the WU-1a or WU-1b wireless mobile adapter. And a great feature of Nikon cameras that feature Wi-Fi connectability is that you don't need to be at a Wi-Fi hotspot. The camera and your smart device create the connection. You can even use your Android™-powered smartphone/tablet or iPhone®, iPad® and iPod touch® as a remote to shoot photos with—allowing you to get into the shot along with your other subjects, or even place the camera in a location to capture wildlife while you snap the shutter from a remote spot far from the wild animals. What’s really fun is that you actually see the same image the camera sees on your smartphone or tablet’s LCD screen—allowing you to shoot at precisely the right moment that you want. It’s easy to share still images and Full HD video with your friends and family using the compatible Nikon DSLRs and their optional wireless mobile adapter. You can share still images from your Df DSLR (which does not offer video capture capabilities) and the COOLPIX and Nikon 1 models that use the wireless mobile adapters. Download the free “Wireless Mobile Adapter Utility” (WMU for short) app. from the App Store or Google Play™ Store. Once the app is installed, follow steps 2 - 6 every time you want to shoot with your camera and upload images using the WU-1a/WU-1b Wi-Fi adapter. Insert the WU-1a or WU-1b into the accessory terminal port on the camera body and turn the camera on. Press the button on the WU-1a/WU-1b, holding it down for about 5 seconds, until the LED on the adapter flashes. On your smartphone open the Wi-Fi settings and select the Nikon camera’s network from the list of networks available. It will begin with Nikon, followed by a string of letters and numbers. For Android™ smartphones, once you initially make this network connection, your device will automatically connect when you enable the camera's Wi-Fi. For iPhone®, iPad® and iPod touch® users, you'll have to perform this step each time you wish to use the wireless feature of your Nikon camera with your smartphone. Once the connection is established, the LED on the adapter will glow green. Launch the WMU app. Upon selecting the Take Pictures Remotely option in the app, Live View is started automatically, allowing you to now see what the camera sees. Upon selecting View Pictures, you can view the photos stored on the camera’s memory card and choose those to download to your smartphone. Your imaging needs and smart device will likely determine the file size/type that you shoot images with that are going to be transferred from the camera via Wi-Fi. Your high resolution camera creates large files and you probably won’t want to shoot using the maximum resolution of the camera if you’re planning on sending images to a smart device using Wi-Fi. This is because the larger the file size, the longer it will take to travel from the camera to the device, so it is suggested that you use JPG rather than NEF. JPG fine/large will also give you larger files than choosing JPG Basic/medium or small. If you're shooting images that will only be displayed digitally, you can go ahead and set your camera to record smaller size files. For folks who want to shoot using the higher resolutions available in your camera, set the app up so that it only downloads the recommended size or even smaller VGA size image while recording the high res. image to the media card in the camera. This can be accessed via the settings menu in the app. When you are done shooting, turn the camera off and disconnect the WU-1a/WU-1b adapter. 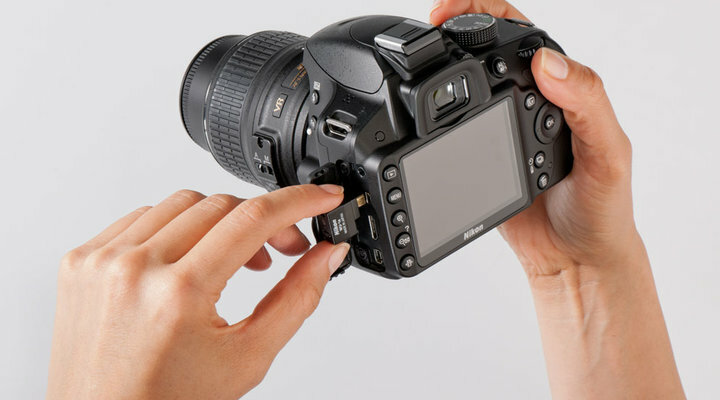 If, while shooting, you turn the camera off to conserve battery power, the Wi-Fi adapter will also be powered off, however when you turn the camera back on, the Wi-FI adapter will turn back on and should reestablish the Wi-Fi connection automatically. (If the connection is not automatically reestablished, simply select the Wu-1a/WU-1b device from the device menu in your smart phone or tablet. Once the files are on your smartphone or tablet, that device’s Wi-Fi or cellular service is used to send the files on to websites or attached to emails. (l.) The menu screen of an Android-powered smart phone or tablet is similar to (r.) the menu screen of the iOS device (as of the August 2013 update). By using the Wireless Mobile Adapter Utility App installed on your Android- or iOS-powered smart device, you can remotely take photos via your smart device, download photos from your camera and share them with friends. From within the wireless mobile utility app on your smart device, you can photograph a subject remotely. Here we've got a friendly Golden Retriever dog posing for the camera. The aperture and shutter speed are shown just below the image, with thumbnails of previous images that were shot and downloaded to the device. In the settings menu of the wireless mobile utility app, you can choose whether you want images to automatically download upon capture—as is happening here—or only when you select images on the camera's media card for downloading to the smart device. You can find the Download Size Options in the settings menu, under image size. We've selected this image of the dog for downloading to the smart device. This screen shows the download status bar as the image we've chosen is downloaded from the camera to the smart device via the wireless mobile utility app. Here is the final image of the dog that we photographed, using the wireless mobile utility app, downloaded to the smartphone. Once connected to your smart device using the wireless mobile utility app, when you select view photos, you'll be able to choose from the pictures on the camera, the camera roll (on the smart device) or the latest downloads (to the smart device). After you've selected files to download to the smart device using the wireless mobile utility app, click the word DONE to start the download process. Once you select the images to download, you will be asked to confirm the download. Clicking yes will start the download. A status bar will show the progress of the downloading of images from the camera to the smart device using the wireless mobile utility app. A message will display within the wireless mobile utility app, on the smart device when downloading is complete. Click OK to go back to remote shooting or downloading more images. On your smartphone or tablet, download the Wireless Mobile Utility app. The noted cameras' Wi-Fi® capability (whether built-in or using the WU-1a/WU-1b Wireless Mobile Adapter can only be used with a compatible iPhone®, iPad®, and/or iPod touch® or smart devices running on the Android™ operating system. The Wireless Mobile Utility application must be installed on the device before it can be used with the camera.